Having a well-defined vision can be more empowering than laying that first stone. If it's clear and unique enough, your staff can apply it easily. Then you've given them a conceptual guide... or legacy that will outlive you and your building. 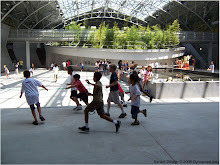 Think of Frank Oppenheimer at the Exploratorium- his values are carrying on long after he's gone. Another example is Al De Sena's vision from Exploration Place. To this day the staff at Gyroscope can cite it. It sheperded the exhibit development process by giving the team a point of view that helped them determine what to include and what to leave out. 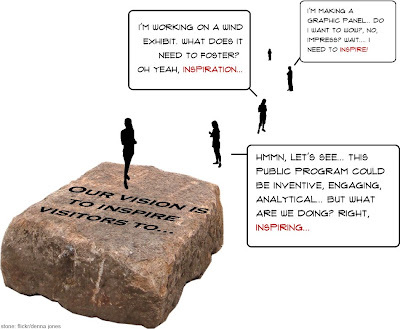 "Inquire, imagine, express, and design?" It's important to have a vision that lets you exclude things. That helps define who you are, and who you are not. As my mom would recite: "You can't be all things to all people, Maria." "For decades, women have been chronically underrepresented in the sciences. More than two decades of research has uncovered a source of this bottleneck: real differences between how women and girls approach technology and the sciences versus men and boys. Women and girls tend to view technology as a tool for communication, companionship, and social utility, often focusing on what technology can “do” to improve the conditions of everyday living. In contrast, men and boys tend to view it as an object that will help them transcend the barriers." 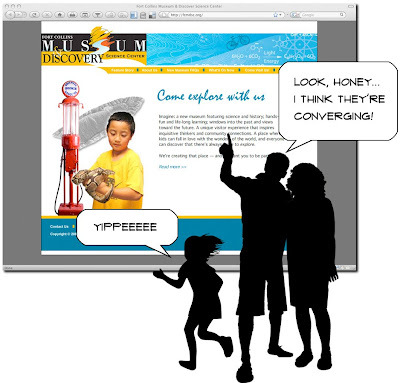 Historically, science museums (through no fault of their own) have catered toward a more boy-centric approach to science exhibits. Think of phenomena rich, context "lite" traditional science exhibits. Turns out maybe girls just wanna have more... connection. We're working on what more gender-equal science exhibits might look like. Stay tuned for research and insights as we progress... and feel free to point us to any info you've found! History of Gaming Meet the Future of Gaming? "...collects, studies, and interprets electronic games and related material and the ways in which electronic games are changing how people play, learn, and connect with each other." This photo DOES feel a bit historic to me, since my current (albeit limited) experience with games has been spearheaded, influenced, or introduced to me by women. 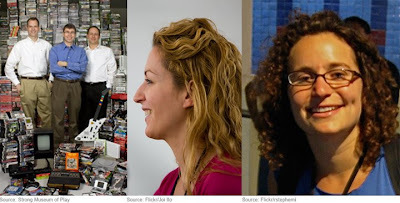 The likes of Jane McGonigal (above center) and Nina Simon (above right) to be precise. At first blush, the change in women's approach to games seems to be about using games for a purpose, or harnessing social power. Such as Superstruct (figure out how to save the world from demise in 2019), World Without Oil (the name says it), and now game-meets-web2.0-thinktank: Signific. Wonder what a history of gaming will look like in 20 or 30 years time? The New York Times has a section on Museums. Nice. 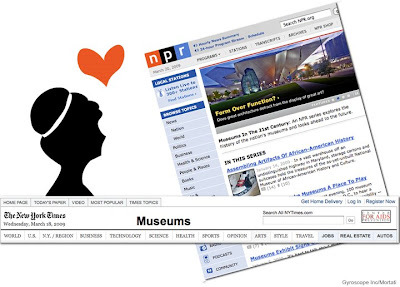 Recently, National Public Radio did a series on museums (which I wrote about). Not only are they reporting and revealing, but they're also getting at some of the trends we've all be practicing and preaching. Which makes our jobs easier and harder. We've got to deliver and making it compelling, and we've got to keep innovating. We're up for it- how about you? I commented on our waitresses tattoos recently. I thought they were beautiful. Instead of just saying "thanks", and refilling my coffee, she filled me in. They were primarily floral (the ones we could see), and were flowers that reminded her of her mom who passed away when she was young. Her mom loved them. "Gladiolas for remembrance, poppies for anticipation of the last day", and so on. I'll always remember she has a lion supporting a bull on her back even though I never saw it, because it's her mom's sign and hers. This experience reinforced the idea I've written about before. 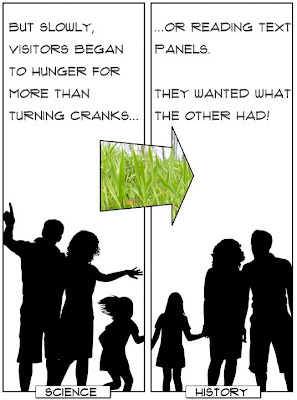 If you can provide an emotional hook, you'll create a cognitive "stickiness" for your ideas. I'll remember that this woman loved her mom, and reflected it on her body. Won't you? Many thanks to Leah Douvris, at the Virginia Cafe. I had a frustrating museum experience last week. I was visiting the Oregon Museum of Science and Industry and caught one of the da Vinci exhibits that is making its way around the globe. 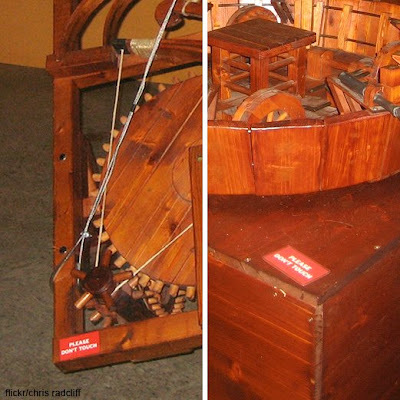 It was filled with burnt umber walls, yellow ochre drawings and large, robust wooden models of da Vinci's ideas. They looked like they were built to handle some... handling. Yet I was "greeted" with Don't Touch stickers plastered over all but a half-dozen exhibits in the back, and no photography was allowed. Yes, I know that it's not feasible to allow the public to touch all these kinetic exhibits- for their safety as well as for budgetary issues. However, is it essential that you can't take a picture, or write a note? I found it extremely frustrating to see a room full of kinetic objects about flight, gravity, motion, energy... just sitting there. If you can't touch it, at least animate it... give it some life. Especially in the context of a hands-on science museum. The thing I did like was that outside the exhibit hall they showed da Vinci-esque projects from local school kids. That was pretty cool-- I wanted to see some more of those. Artists as Public Programmers - is this about audience? Building on the theme for the week of exploring the role of artists who “do” public programs, I began to wonder if this was a question of demographics and audience? I mean, look at the picture above- everyone is in their 20’s - 40’s, and possibly single or newly married. Which got me to thinking about other public programs that aren’t held in museums which reach a similar demographic- science cafés. 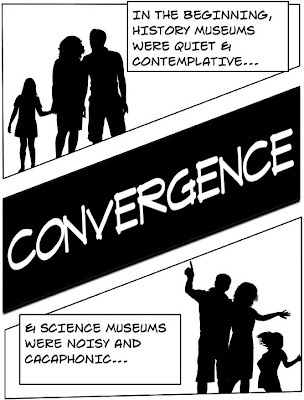 I love the idea, and went to a fun and informative science cafe session at ASTC last fall (I made a comic about it, you can find it, and DIY links here). Ever since, I’ve been encouraging clients to pursue this particular audience through such a mechanism (going to them, or catering to their lifestyle). 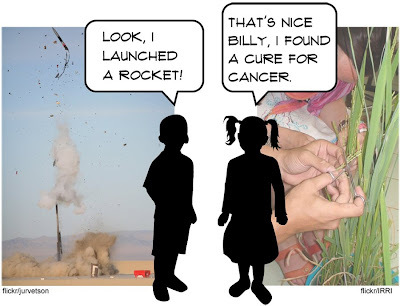 I mean, why should kids have all the fun? It’s pretty clear that “in this economy”, folks are looking to do more with less, and closer to home. This could be a silver lining for museums- especially small ones. Take advantage of the moment and start a relationship with a local bar or restaurant. Start a science lecture series or art or whatever. Great resources and examples abound for how and why. Which is what I think artists are doing. However, their interest isn’t geared so much at reaching a certain demographic-- that just IS their demographic. 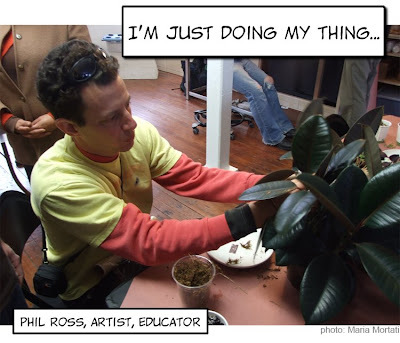 Phil Ross wants to understand modern science, and as part of his process, he’s making it accessible. Isn’t that what your museum wants to do? Artist as Public Programmers: so what? So what if artists are producing science programs outside of museums? What does that mean for museums? In her Monday post on Deliberately Unsustainable Business Models, Nina Simon made the point that museums need to do more than survive, they need to learn from such folks as the Mark Allen's (and the Phil Ross's) and also focus on being awesome. But what artists are doing without funding -and often without the brutally political overhead of an institution- is take and idea and run with it. Museums are houses to idea that has passed, contemporary or otherwise. Their job is to innovate on how to bring those ideas to the masses. 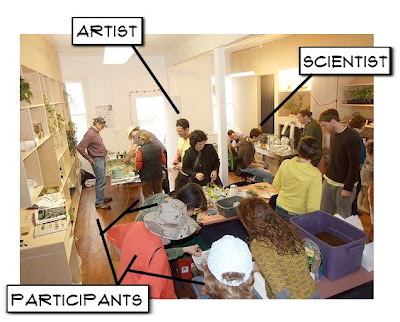 For the large ones, their part-time job can be to foster research and innovation, or foster connections amongst ideas (I'm thinking of the Lab at Belmar's "Mixed Taste" series). The job of the artists and scientists is to do their creative work - whatever it may be. What this means for museums is that they need to continuously find new ways to bring attention to, or engage with the work of scientists and artists on a larger scale- while making them accessible is a goal. Being awesome while doing is hopefully a core value. Next: is this a question of audience or accessibility? On Saturday, I went to an event called "Clone Home". 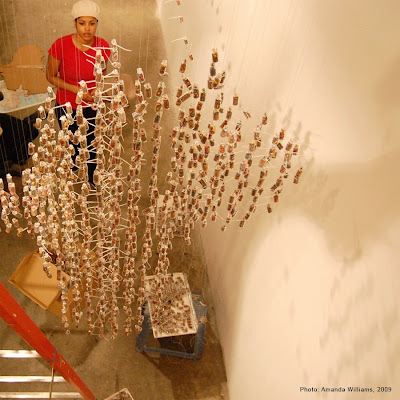 It was produced by the bio-artist Phil Ross at a flexible gallery/workshop space in San Francisco. It's part of a series of events called Critter Salon. The interesting thing is that he's an artist who is doing basic science outreach programs- and they're informal, engaging, and fun. 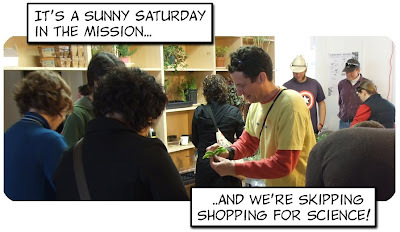 You can see pictures of the event (and me, playing with plants, of course) here. I'm going to explore some of the questions and ideas this event raised in my mind this week. 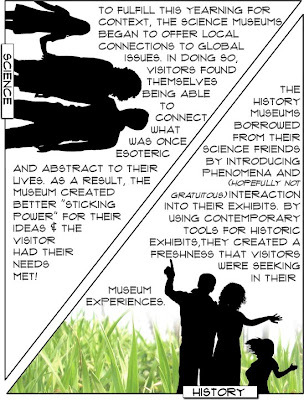 Such as, what does it mean if the programs are happening outside your museum? What need is that fulfilling? "Personally, my approach is not hit you over the head-- (the installations) allow people to come in (to the issue). I present the information and my perspective on it, and find most people are curious enough about the issues so that they ask questions. Think I've found or made a few converts. "